In 1994, Nintendo released Super Metroid for the Super Nintendo Entertainment System to critical acclaim. Along with 1997’s Castlevania: Symphony of the Night for the Playstation, Super Metroid helped create an entire sub-genre of exploration based, non-linear 2D adventure games dubbed Metroid-vania. And then the franchise went dark for 8 years. In those 8 years, gaming transitioned from 2D sprite-based games into full fledged 3D worlds. The Metroid franchise was completely absent from an entire generation of consoles, and Samus’ only appearance on the Nintendo 64 was in the first iteration of the party brawler Super Smash Brothers. This allowed two things to happen to the Metroid community. First, Super Metroid went from being a critically acclaimed game to a cult powered megaton. Due to the reward structure offered by completing the game under certain constraints, Super Metroid was a perfect fit for the evolving speedrunning community. The second effect the gap in these games had on the franchise led to two different thoughts about how the game should proceed in the era of 3D gaming, with vocal fans arguing that the next Metroid game has to be a 2D successor to Super Metroid, and a reluctant fan base wondering if the game could even make the transition into the 3D world. After all, not every beloved franchise could make the jump to 3D, just look at Sonic the Hedgehog. In 2000, Nintendo finally unveiled Metroid Prime to the world at Spaceworld 2000, a small convention in Japan where Nintendo shows off all of its new games and hardware. Instantly, people were skeptical of Nintendo’s decision to pursue not only a 3D iteration Metroid, but also one that was first person as well. All of these obscure and confusing choices led to Nintendo releasing one of the great games ever made in the fall of 2002. In the late 90s, Nintendo was swimming strong through the 3D era ushered in by the PlayStation and its own Nintendo 64 console. While PlayStation games were releasing left and right, the Nintendo 64 only had 388 games released over the course of its lifespan. The biggest contributing factor to this was that Nintendo was still using cartridge based hardware, while the Playstation had moved on to easier to produce disc-based storage. Yet when gamers remember that era of gaming, Nintendo 64 games are still held in high regard. One of the biggest standouts of that generation of gaming was the absolutely ridiculous, and absolutely awesome, Turok series. Made by the Austin based Iguana Entertainment, Turok spanned six games, with the most successful games of the series being the Nintendo 64 versions. Looking to keep the momentum going from the dinosaur slaying shooting, Nintendo found a new studio with Iguana Entertainment founder Jeff Spangenberg. Dubbed Retro Studios, the small company began to work on multiple titles for Nintendo’s next piece of hardware, the Nintendo GameCube. Retro Studios was developing four titles for Nintendo, but none were seeming to take shape. Shigeru Miyamoto himself visited the studio and only saw promise in one project that wasn’t even a game. It was a simple shooter engine titled Action-Adventure. Miyamoto suggested it would be a good fit for the Metroid franchise, and Retro Studios began work on a small demo to present at Spaceworld 2000. After the success at Spaceworld, Retro Studios cancelled the other three games they had in development to focus solely on Metroid Prime. During the last 9 months of production it has been reported that the development team was putting in 80-100 hour weeks. All of that hard work paid off, as Metroid Prime received stellar reviews and was marked as a return to the franchise’s forgotten glory days. Samus Aran is one of the most, if not the most, important female character in gaming. She carried the torch for the likes of Lara Croft in Tomb Raider, Jade in Beyond Good and Evil, Commander Shepard in Mass Effect, Sarah Kerrigan in Starcraft, Chell in Portal and countless other gaming heroines. Her surviving the transition to 3D was not only important for the continuation of the franchise, but for gaming as a whole. In her debut in 1986’s Metroid for the Nintendo Entertainment System, it wasn’t revealed that Samus was a woman until you completed the game. The original instruction manual for the game even refers to her a he. This has lead to some great fan discourse in support of the theory that Samus is not just a woman, but a transgender woman. Samus is one of the founding mothers of gaming, and to see her survive the transition to 3D meant that she would truly be a timeless gaming icon. Many parallels exist between Samus Aran and another science fiction heroine, Ellen Ripley. Both of these women face extreme isolation. Ripley is constantly facing off against various Aliens, only to become a surrogate for the species by the end of the series. Samus is constantly facing off against various Metroids, only to become a surrogate for the species by the chronological end of the series. Ripley exterminates Aliens on LV-426 in the second iteration, Samus hunts Metroids on SR-388 in the second iteration. Ridley, the dragon enemy that plagues Samus throughout the series, is even named after Ridley Scott. The similarities don’t end there of course, and I could go on and on, but I will spare you. At the beginning of Metroid Prime, Samus arrives on a space station crawling with parasites keen on infecting anything within their grasp. Shortly after exterminating their Queen, she is attacked by her nemesis Ridley. After losing all of her power-ups, she follows Ridley to the desolate planet of Tallon IV. Having some of these power-ups at the start of the game just to have them ripped away, is one of the most brilliant design decisions the game makes. It gives the player a taste of some of the fancy toys in Samus’ arsenal, and then removes them, leaving Samus to explore the ruins of Tallon IV with nothing but her standard blaster and her scanning visor. Not only is Samus alone on the planet, but she is not as strong as she used to be. 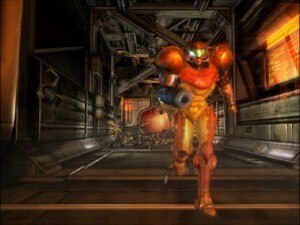 Like Ripley, the player has to navigate Samus through hostile environments just to come out ahead. 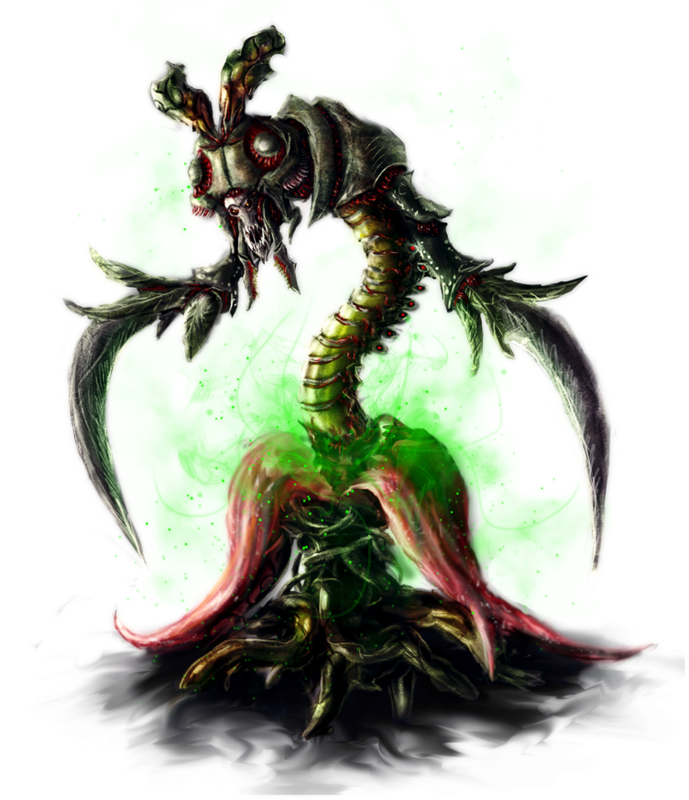 Most of the enemies Samus fights are not mindless aliens pointing guns, but terrifying creatures that have evolved to live in the harsh locales you must cross. The difficulty curve in the enemy design helps play into the dangers of Tallon IV too. At the start of the game you face off against creatures that simply dive bomb or charge at you. By the end of the game you are facing full fledged monstrosities with complex attack patterns the size of entire rooms. The most controversial mechanic in Metroid Prime is its best mechanic. Most games, especially those that have a first-person perspective, interact with their world through the action of shooting. While Samus does have a weapon to defend herself with, using her scan visor enhances her arsenal and abilities throughout the game. It sounds boring. Really boring. Miraculously, the mechanic adds a great collection element to the game beyond health and missile upgrades. Nearly everything in the game can be scanned, from flora to enemies to ancient relics. This brings two major impacts to the experience: It helps drive home the feelings of isolation and it helps build immersion. All of this is done through a robust point and click like experience, driven entirely through text. This collection element is also a key staple of the Metroid franchise, unlocking the best ending. If you don’t scan everything in the game at least once, it counts against your completion rate. In previous installments this was measured by Missile Capacity Upgrades and Health Upgrades. In Prime the addition of this element added to the collection percentage, all without breaking immersion. So many open-world games like Grand Theft Auto and Assassin’s Creed have you collecting items that don’t do anything, but increase a counter in your menu, artificially expanding the game. The scan visor added to the collection element of Prime in an engaging way that very few games have done since. Adding scanning also allows for things to be hidden throughout the levels in previously unreachable areas. Once you start unlocking power ups, revisiting old areas isn’t just a simple backtrack, it is an opportunity to discover the history of Tallon IV. With nothing but her Scan Visor and standard Power Beam in hand, Samus begins exploring the regions of Tallon IV. The game is divided into 8 major areas: The Space Pirate Frigate, Tallon IV Overworld, The Chozo Ruins, Magmoor Caverns, Phendrana Drifts, Phazon Mines, The Crashed Frigate, and the dreaded Impact Crater. Through the series staple of backtracking, as a player you are constantly traversing these lands time and time again as Samus’ power set grows. After getting the Speed Boost Ball in Phendrana Drifts, entire new paths open up in previous areas. Once you acquire the Super Space Boots which allow you to double jump, the upper areas of Magmoor Caverns are accessible. While there is a hint system present in the game to help guide you across these vast expanses, the most rewarding part of the game is figuring out how to navigate through Tallon IV yourself. Environmental cues help guide you, and if you start to recognize them all, working your way towards 100% completion becomes a habit. In addition to the Scan Visor, Samus acquires an X-Ray Visor and Thermal Visor as well. Like any good piece of Metroid equipment, this opens up a whole new element of interaction between Samus and her environment, and it is astonishing to see. Additions like these were not available in the 2D Metroid games, simply because of hardware limitations. Same goes with the beam types. In the previous Metroid games, all of the beam types stacked, allowing Samus to fire and forget once you get the final beam type. Forcing the player to change between the four different beam types and missiles allowed for a more complex enemy and puzzle design. Plus if the lighting was just right when an explosion went off nearby, you could see Samus’ reflection in the helmet visor. This game oozes immersion, from its level design all the way down to the subtle way the hud sways during movement. Serving as an intro to Metroid Prime, The Space Pirate Frigate is a nearly perfect 20 minute experience. As you explore the abandoned frigate, parasites roam the corpse filled halls. After facing off with the Parasite Queen, an explosion starts the 7 minute escape timer, forcing Samus to blast through the remaining Space Pirates and use her Morph Ball to navigate through the ventilation shafts. After a brief stare down with Meta-Ridley, her now robotic nemesis, she loses most of her abilities and follows him to the surface as the frigate explodes behind. What makes this introductory experience so jarring, and memorable, is that it’s unlike nearly anything else in the game. Aside from boss battles, there is very little stress present throughout the rest of the game, but after fighting the Parasite Queen, player stress is at an all time high. The sound design of the alarm constantly blaring in your ear as you go room after room hoping to escape brings a certain amount of tension that goes ignored in most gaming experiences. It is a concise and complete experience from beginning to end, with very little player choice present. It is a completely guided experience, and once it is over, players are left to their own devices. This level cannot be revisited, and provides a key element in the story telling of Metroid Prime. By taking away all of these abilities from the player, it gives you something to strive for in their adventure to follow. The Space Pirate Frigate even made an appearance as a level with rotating platforms in Super Smash Brothers Brawl as Frigate Orpheon. After landing her ship, Samus embarks through the rain to find an calm, yet harsh environment where she isn’t welcome. Thick carpaced bettles jump out of the ground to charge her, plants filled with gasses explode from the slightest provocation, even the grass slows her movement speed to a crawl. Since Samus has been stripped of all of her abilities like her Charge Beam and Morph Ball, she is left practically defenseless to explore this unknown territory. To make matters worse, it is raining, and I think we can all agree that rain makes everything worse. As raindrops bounce off your shining armor, you are left to your own devices to explore the area. As the name of this area implies, the Tallon IV Overworld serves as a hub for Samus to travel through once the adventure starts progressing. Players frequently pass through this area once all of the other areas of the game start to open up. 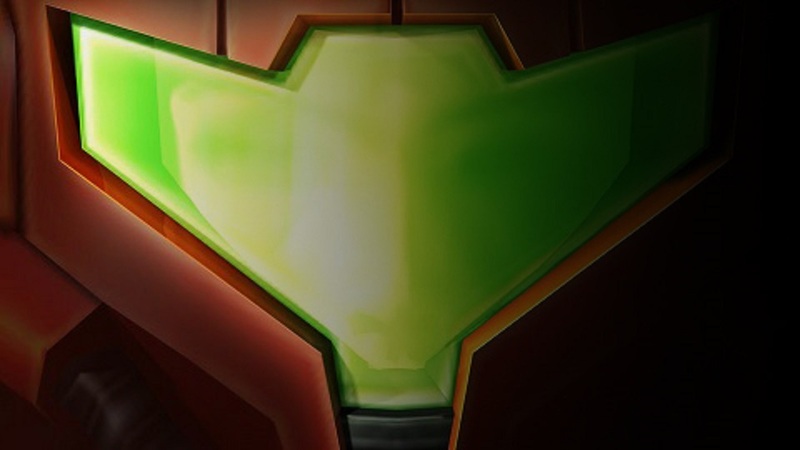 The first area of Tallon IV that Samus explores sets the tone for the remainder of the game by focusing on the harsh environment, eerie soundtrack and putting Samus into a state of complete isolation. The ruins themselves tell a tale of a forgotten society entirely through text! Using aforementioned scan visor, the only adversaries Samus faces in this area are predators of the environment. The Space Pirates with their own blasters don’t make their presence known in this area until much later in the game when you are back tracking through with new power ups. Eventually, Samus comes across discarded technology that has fought with the environment, such as a security system that likes to light things on fire. This all culminates in Samus fighting the mighty beast Flaahgra, a weird mix between a bug and a plant. The scale of Flaahgra helps drive home the themes of powerless-ness early on in the game, but once the player takes down the beast, it brings about a great since of accomplishment. These giant larger than life bosses help the player feel as if they are always on their back foot, pushing forward against all odds to conquer something they might not believe they could. After initially exploring both the Tallon IV Overworld and the Chozo Ruins, Samus finds herself in the Magmoor Caverns, a harsh volcanic section of Tallon IV. It is here where she first encounters a remote Space Pirate facility embedded into the caves below. Through the scan visor, the player starts to uncover the reason the Space Pirates are so interested in Tallon IV: a rare super organism called Phazon. This material is highly radioactive and the Space Pirates began investigating how to potentially use it as an energy source. The first few strands of Phazon in the game can be encountered in Magmoor Caverns, and starts to flesh out the world of Tallon IV. 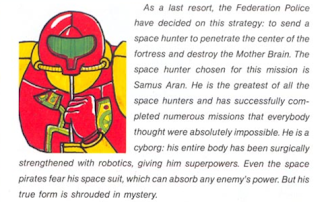 While Samus may be fighting small bands of Space Pirates here and there throughout Magmoor Caverns, the largest threat for her until she gains the Varia suit is the environment itself. Like the Chozo Ruins before, Samus is constantly battling the planet as well as the Space Pirates. Phendrana Drifts has, without a doubt, the best music in the game. It focuses directly on the isolation and whimsical area Samus explores. It is acompanied by on screen beauty and an errie stillness of snow falling among more dilapidated Chozo ruins. While there was a bit of a mystery as to the location of the Chozo in their previous ruins, this section of Tallon IV all but confirms that the Chozo are a lost race. While Magmoor Caverns was threatening just to be around and explore, Phendrana Drifts brings new challenges and bosses that test Samus’ skills, while also being the point in the game where the player starts to discover the back tracking element of Metroid Prime. If you are following the path as the developers intended, almost immeadiately upon discovering Phendrana Drifts, you are forced to return to Magmoor Caverns. This idea of teasing the player is what makes the backtracking in this game so rewarding. As a player you are forced to build a mental map of the world and remember an always increasing amount of abilities and how those abilities in turn interact with the environment. Phendrana gives the players their first taste of this. One of the key staples of the Metroid franchise is backtracking through previously explored area’s once you start unlocking new abilities. What also makes this enviroment incredibly different from the others is its mechanical aesthetic compared to the more environmental harshness of the other sections of the planet. Top that off with a largely vertical structure to the layout, and Phazon Mines really set’s itself apart from everything else in the game. It is also where Samus starts to encounter the life-sucking creature the series gets it’s name from: The Metroids. As various types Space Pirates roam the halls, a giant pit of the the radated Phazon sits beneath, so if the player misses any number of important jumps, they are destined to retread a lot of ground to make forward progress. Once the player unlocks the radiation immune Phazon Suit, Phazon Mines becomes a true playground for players to test their skills. The Crashed Frigate allows players to re-explore the Space Frigate from the first twenty-minutes of the game, just… destroyed and crashed into the surface. It connects directly with the Tallon IV Overworld, and is a relatively small area of the game. It is nice to revisit the area where you lost all of your abilities with even more tools than when you first boot up the game, but this section of the game pales in comparison to the vast open vistas Samus traditionally explores. Throughout all of this grand adventure spanning Tallon IV, Samus is slowly collecting 12 artifacts hidden away in some of the most creative places that are just outside the normal flow of gameplay. Their locations throughout the world encourage exploration and allow players to showcase their exploratory abilities like no other. Once Samus has all twelve artifacts, she returns them to their resting place in the Chozo Ruins, only to be ambushed by Meta-Ridley in the penultimate battle. At the end of the battle, striking a near fatal blow to Meta-Ridley, Samus is thrown into the Impact Crater, inches away from the meteor that brought Phazon to Tallon IV. It has infected one more creature, the titular Metroid Prime. Surprising just about everyone, Metroid Prime not only worked as a Metroid game, it is widely regarded as one of the best games of it’s generation. The review aggregator Metacritic, which tallies reviews on all sorts of media, has Metroid Prime rated at 97% for critics, with 70 positive reviews and 0 mixed or negative reviews. While that is a legacy in itself, the User Reviews on Metacritic show 249 positive reviews, 19 mixed reviews and 9 negative reviews. The game itself has spawned a two proper sequels, and three spin-offs. The two sequels, Metroid Prime 2: Echoes and Metroid Prime 3: Corruption, were both made by Retro Stuidos for the Gamecube and Wii, respectively. 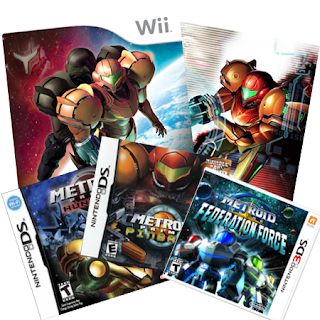 All three games eventually got bundled into a collection disc for the Wii, titled Metroid Prime: Trilogy which featured new motion controls for both Prime and Echoes. In 2005, Silverball Studios released Metroid Prime Pinball for the Nintendo DS. The game is exactly what it sounds like, with pinball tables of the major areas from Prime and Samus in her Morphball form throughout the entire game. The second spin-off was 2006’s Metroid Prime Hunters, also for the Nintendo DS, which introduced multiple bounty hunters to rival Samus. Finally, in 2016, Nintendo released the critically panned Metroid Prime: Federation Force for the Nintendo 3DS. In 2017, Nintendo released Metroid Samus Returns for the Nintendo 3DS, the first 2D Metroid game since 2004’s Metroid Fusion on the Gameboy Advance. The title released to lukewarm reception from fans, and sold well enough that Nintendo could call the game a ‘win’. The biggest addition to the Metroid franchise, Metroid Prime 4, was announced at E3 2017, but beyond a title and a platform, the Nintendo Switch, nothing else was shown. Will it recapture the energy and adventure of the original Metroid Prime, or be a disappointing footnote in the series? Sales wise, Metroid Prime is the most successful game in the franchise with over 2.82 million physical units sold according to VG Chartz. This does not include the additional 650,000 units sold of the Metroid Prime: Trilogy, which includes Metroid Prime and it’s two sequels. This does not count any digital versions of the game sold through the Nintendo eShop. In the gaming world their exsists a small community of gamers, dubbed speed runners. They aim to beat games in the most ridiculious ways possible, and as fast as possible. This entire community exsists on the backbones of Metroid Prime. In the Metroid games, backtracking is a requirement. It is one of the staples of the franchise. Yet people push the game to the limits to break the order in which you are supposed to accomplish things. These little tricks can be done by glitching players through walls, or making perfect jumps without losing momentum. 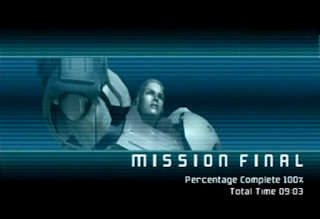 Everything in a game as structured as Metroid Prime is designed to be accomplished in a certain sequence, but speed runners, in an effort to get the best completion time in a game, opt to break that sequence. 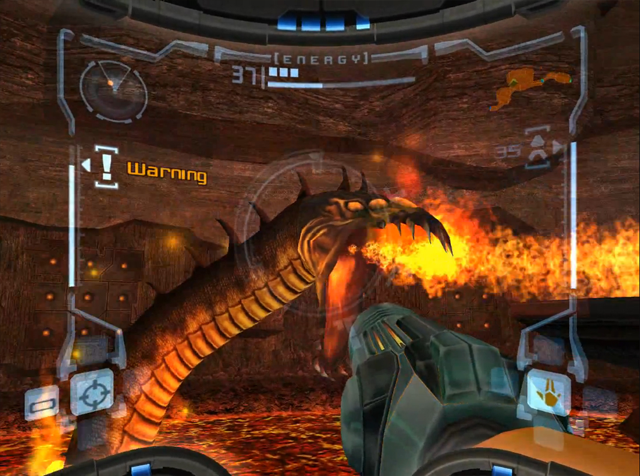 Using a technique called sequence breaking, players can skip entire sections of the game, and this term originated because of Metroid Prime. 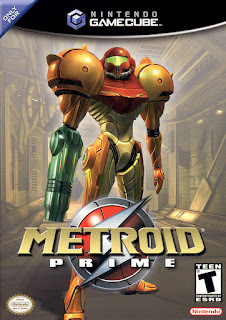 Other games before it used what is now recognized as sequence breaking, but because Metroid Prime came out around the early days of the social internet, the term was coined first during its early days of speed running. If you look at the speed running leaderboards on speedrun.com, widly regarded to be the foremost authority on the subject matter, the Metroid Prime speed running community is still going strong, with the differences between first and third place for an Any % run being a mere two minutes. This community exists for any number of video games, but Metroid Prime gets the privilege for dubbing a term used for every game that gamers speedrun. Sadly, after the dismal reviews and sales of Metroid Prime: Federation Force and Metroid Other M, the future of the entire Metroid franchise is unknown. While Metroid: Samus Returns was okay, I don’t think it was the triumphant return to glory fans were hoping for. Similar to the Nintendo 64, the Wii U did not see a Metroid game produced for it throughout it’s entire lifespan. Retro Studios is still around of course, but they have moved on to the Donkey Kong franchise, leaving Samus’ future in question. Part of the magic that Metroid Prime has pulsing through it was due to the long period of silence for the franchise before the game’s release. This past April, Nintendo released their newest console the Nintendo Switch. Many gamers are clamoring for a resurgence of sorts with the Switch, and I can’t think of a better character to lead that charge than Samus Aran. Gaming has also gone through great changes in the past 15 years, with a large focus spent on online play and fostering a community around a single game. There is a prime opportunity for Samus to return to the spotlight, using the lessons learned from Metroid Prime. Through its use of atmosphere, new and interesting mechanics, and a errie sense of calm, Metroid Prime invigorated a dormant franchise. It is time for Samus to do that again.